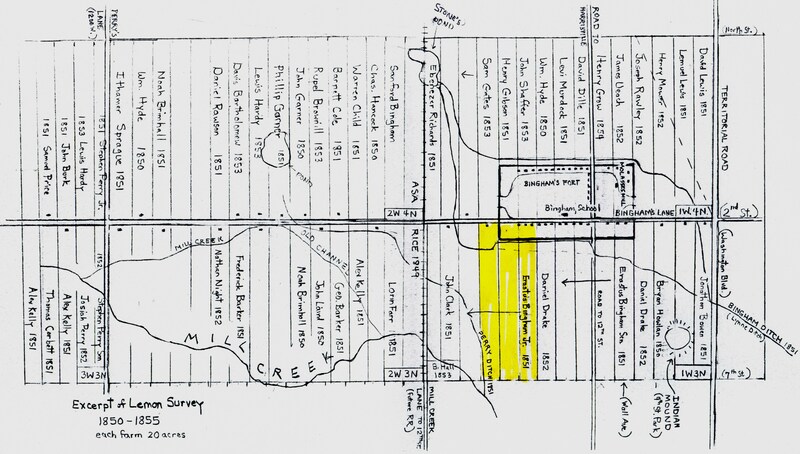 Blocks 1W3N, 1W4N, 2W3N, and 2W4N of Lemon Survey show the layout of early farms on 2nd Street; each block divided into 16 farms, 20 acres each; all these farms fronted 2nd Street; 12 pioneer farm house still remain on 2nd Street today. There are twelve pioneer houses remaining on 2nd Street today that once fronted farms of the Lemon Survey and bordered pioneer irrigation ditches. 2nd Street west of Washington Blvd. (Territorial Road) started development in the 1850s and was soon named Bingham Fort Lane; 2nd Street east of Territorial Road started to grow in the late 1860s. These 12 pioneer farm houses are a rare legacy of the hard work and talent of the first settlers’ efforts to organize and cultivate the land of Weber County. Some of these homes are the oldest homes in Ogden dating to settlement era before the railroad and remaining as superb examples of the agriculture beginnings of the city and the county. Today many people building new houses enjoy selecting house designs, floor plans and landscaping. These choices reflect lifestyle, cultural tastes and what can be afforded. It is of interest to note that the plans and styles of the old historic houses on 2nd Street reflect the same qualities – where they came from, their vocations and their pocketbooks. Each house has a story and collectively these stories help tell the history of the community. The houses are listed in chronological order from a – o on the home page menu. In 1849 a farm was started by Mr. Rice on 2nd Street, located immediately west of the future Bingham’s Fort. There were only a dozen or so families living north of the Ogden River at this time. These early families dug irrigation ditches in 1849,1850, and 1851 bringing the water to the rich farm land on the flood plain of the Ogden River, extending as far as 2nd Street, about three or four miles. (See History of the First Ten Ditches and Mill Creek). In 1850 after the death of Chief Terikee, more and more settlers flooded into Weber County, and Mayor Farr seeing that the farmers were taking up choice spots of land at their pleasure, thus throwing the country into confusion, engaged a surveyor named William Lemon who began surveying the farming land north of the Ogden River. This land was called “The Farming Lands” and was divided into blocks. 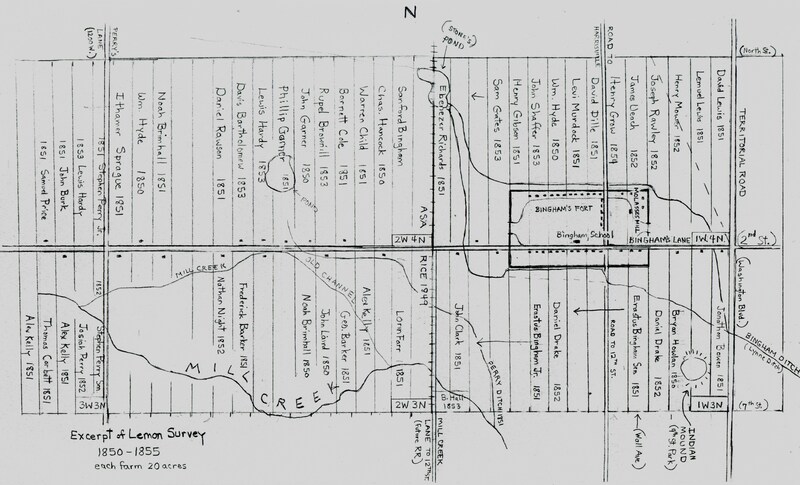 The central line of measure for the Lemon Survey was Territorial Road (Washington Blvd.) beginning at today’s 17th Street (see map below). A block extended a half mile north and then a mile east or west. Each block was divided into 16 farms, each farm having 20 acres. In Ogden the farms fronted either 2nd Street or 12th Street. 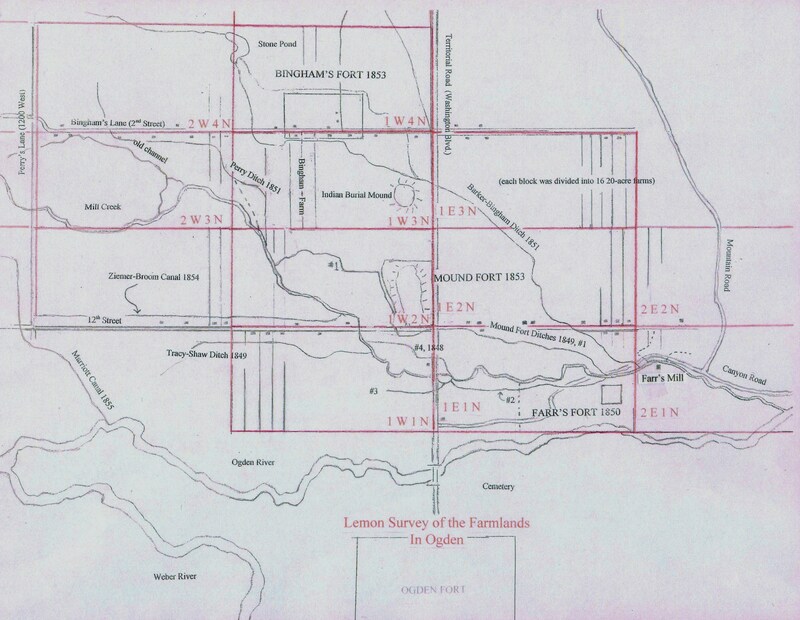 2nd Street was the fourth east- west road on the survey, a dirt lane later known as Bingham Lane, and 12th Street was the second east-west land, also a cow path, later known as Mound Fort Lane. These two streets, 2nd Street and 12th Street, housed the earliest settlers and grew prominent over the next eighty years with historic homes and neighborhoods that fronted the earliest farms and irrigation ditches in Weber County. These two roads and their communities were connected by Mill Creek Lane for almost twenty years, and then the railroad tracks replaced the lane. 7th Street was not a roadway for the first decade; it was merely a meeting place for the ends of the farms that fronted 2nd Street and 12th Street. 17th Street (Higginbotham Lane) and Canyon Road were also popular sites for early historic homes. Lemon Survey of the “Farming Lands” in Ogden. Farms could be claimed without price for the first few years. The survey was called the Lemon Survey in honor of William Lemon who died shortly after commencing the work; it was completed by William M. Dame and Jesse W. Fox. 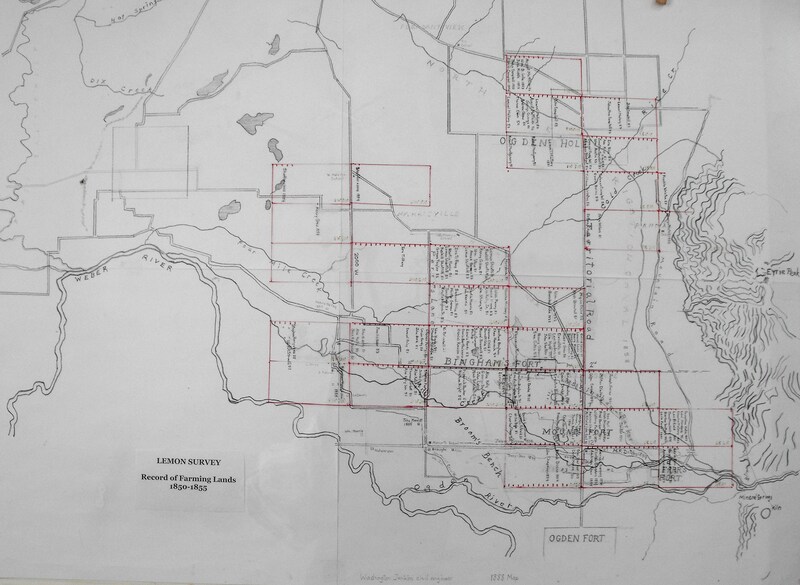 The entire Lemon Survey was six miles square and extended from the Ogden River north to Ogden Hole (North Ogden) and west to the western border of Slaterville. In 2012 one farm laid out in the Lemon Survey is still intact, the Bingham/Stone Farm on West 2nd Street, Ogden. See map. It still includes the original 20-acre spread from 2nd Street to 7th Street that was surveyed in 1850 and claimed by Erastus Bingham Jr.in 1851. Next to Fort Buenaventura this is the oldest pioneer site in Weber County. YESTERDAY: 1851 Bingham farm on Lemon Survey. Andrew Jensen, Slaterville Ward, 1893, Church of Jesus Christ of Latter-day Saints History Library, Salt Lake City, Call number: MS 8349/2. Record of Farming Lands, Weber County, Ut., Church of Jesus Christ of Latter-day Saints Family History Library, Ogden, Utah, Land Records: deeds, VA, 1852-1867, Drawer 561, 1654738. Annie Jones Maw, Historical Information of the Early Ogden, manuscript, in possession of Joyce B. Maw, Ogden Ut. ; Richard Roberts and Richard Sadler, A History of Weber County, 1997, Utah State Historical Society & Weber County Commission, p. 60,61. Charles F. Trentelman, Road Construction Unearths Old Fort, Standard Examiner, 2002. This entry was posted on January 16, 2011 at 9:23 am	and is filed under 3. 2nd St. PIONEER HOUSES & LEMON SURVEY. You can follow any responses to this entry through the RSS 2.0 feed. You can leave a response, or trackback from your own site.